Present us with a design challenge, and we will show you a big ol’ knock-your-socks-off solution. 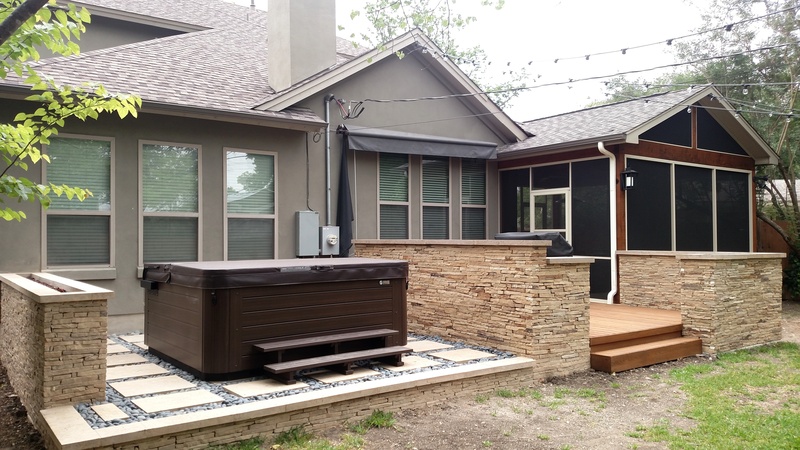 Archadeck of Austin was thrilled to work with this Northwest Austin homeowner to design and build a spectacular outdoor living space, a combination screened room, patio and deck with an outdoor kitchen. One of the things that is so special about this project is its unique patio with a hot tub and a dramatic fire wall. What could be so unique about a patio? Well, that brings us to the challenge presented by this homeowner. 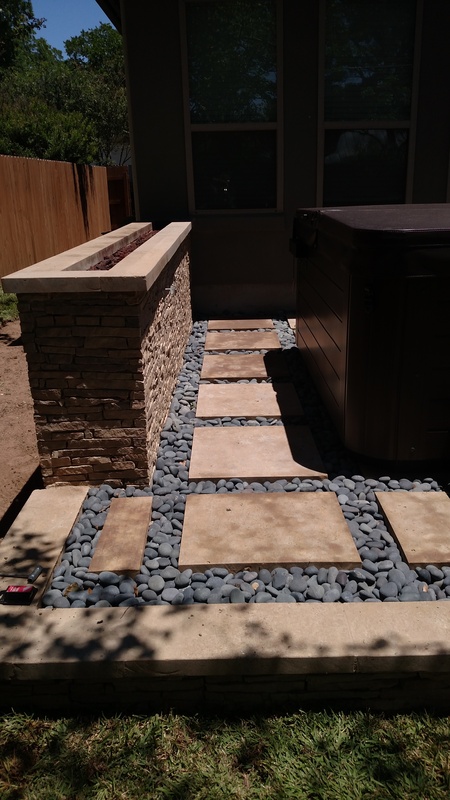 We were asked to design a patio that incorporates the proper drainage for water runoff so moisture will be retained and released properly into the natural aquifers in and around the Austin area. A permeable patio, that is. 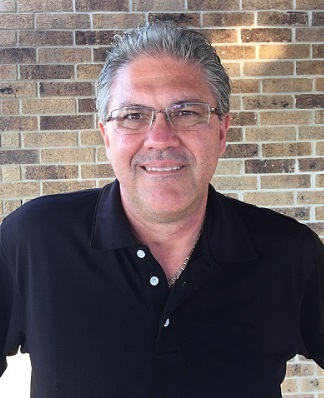 Jim Schallon, Archadeck’s lead designer on this project, managed to meet the technical requirements while creating a beautiful and relaxing oasis for the homeowner, family and friends. The home had an existing wood deck in good shape and just the right size for an outdoor kitchen. By power-washing the deck and restaining it, we were able to restore the wood’s beauty and establish this area as the centerpiece of the project. On one side of the deck, we added a spacious screened room with a new roof cover that we tied into the existing slope system of the house. On the other side of the deck, we added the patio with hot tub and fire wall. 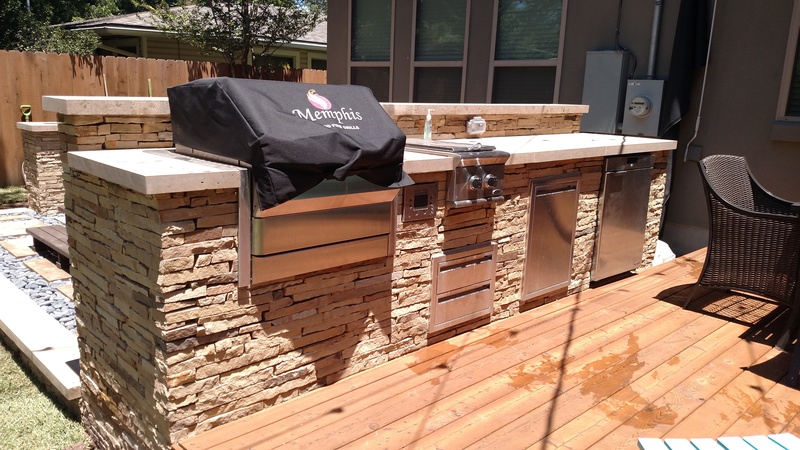 We placed the outdoor kitchen on the deck by building a wall, counter height, with Concrete Masonry Units (CMU, also called concrete blocks) and finishing it with a facing of beautiful ledgestone. 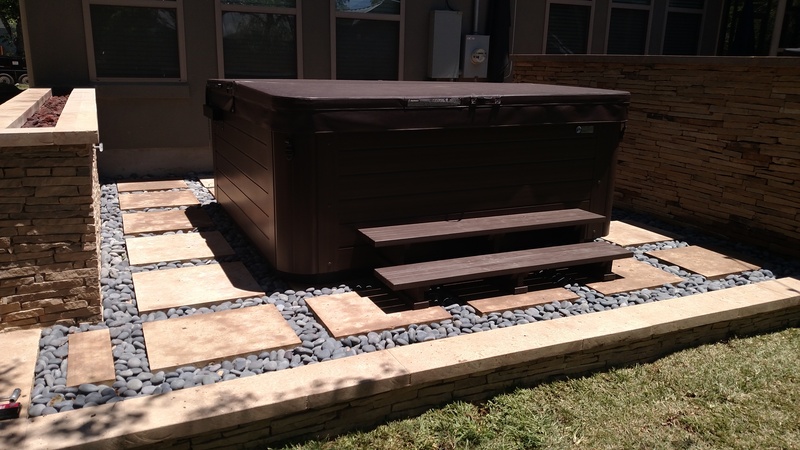 All of the outdoor kitchens designed and built by Archadeck of Austin are built with masonry-cinder block construction. Other builders may use wood for the kitchen structure, since it will be covered with a stone facing and no one will see it. However, our sturdy outdoor kitchen construction won’t deteriorate or degrade over time; it’s permanent. The 1” hand-installed ledgestone facing helps provide a solid support structure for the kitchen counter and appliances. The homeowner chose brown Lueders stone for the countertops, and we used matching brown Lueders cap to top off all of the walls. A dense limestone known for its durability and low maintenance requirements, Lueders stone is perfect for kitchen countertops. This kitchen’s built-in grill alone will command your attention! It’s a Memphis wood-pellet BBQ system with Wi-Fi capabilities. The homeowner can monitor and adjust the temperature of the grill from anywhere; the grill can even send an alert to his smartphone if needed. In addition to the Memphis Wood Fire Grill, the new outdoor kitchen includes a refrigerator, drawers, storage and trash receptacle. With plenty of space on the deck for a dining table and chairs, meals will go from grill to table in an instant. If (or when) insects are a problem, the new adjacent screened room offers a pest-free dining area as well. This screened room boasts a rich Synergy Wood ceiling with ceiling fansto keep the air moving. 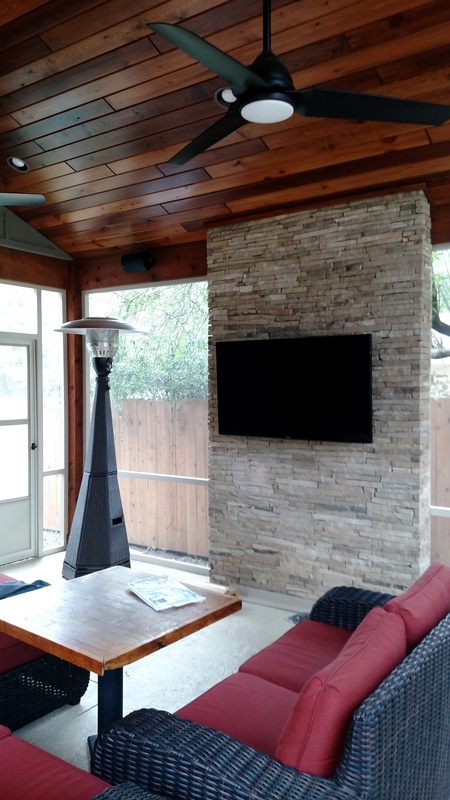 A large flat-screen TV is mounted on a stacked stone wall built just for that purpose; we used the same ledgestone here that we used for walls in the kitchen and patio areas. Of course, we built in electricity to power the TV, fans, lamps and the homeowner’s outdoor heater to take the chill off in winter. The floor of the screened room is a textured stamped concrete that will stand up to many years of constant use. And now for the patio, which had to be permeable. For the base of the patio, we layered gravel and soil. The patio surface is a repeating pattern of large pavers and smooth stones. Together these components allow water to flow naturally through the patio surface while providing a smooth texture on which to walk. Specifically, the patio pavers are 2×2 sawn cream Lueders stone, beautiful and durable. The spaces between the pavers are filled with smooth Mexican Beach pebbles. Not only is the smoothness easy on bare feet but also the river rock feels cool to the touch as it retains the natural temperature of the ground at all times. Prominent on the patio is the hot tub, and next to that we built a gas-burning fire wall, which might just be the fire feature of your outdoor living dreams. It is a ledgestone wall lined with fire brick and filled with lava rock. Hidden there are 60 and 72-inch stainless steel linear T-burners. When lit, flames seem to dance along the top of the wall. The height of the fire wall is about even with the surface of the hot tub, so, as you can imagine, occupants of the hot tub will become a captive audience for this magical feature at night. 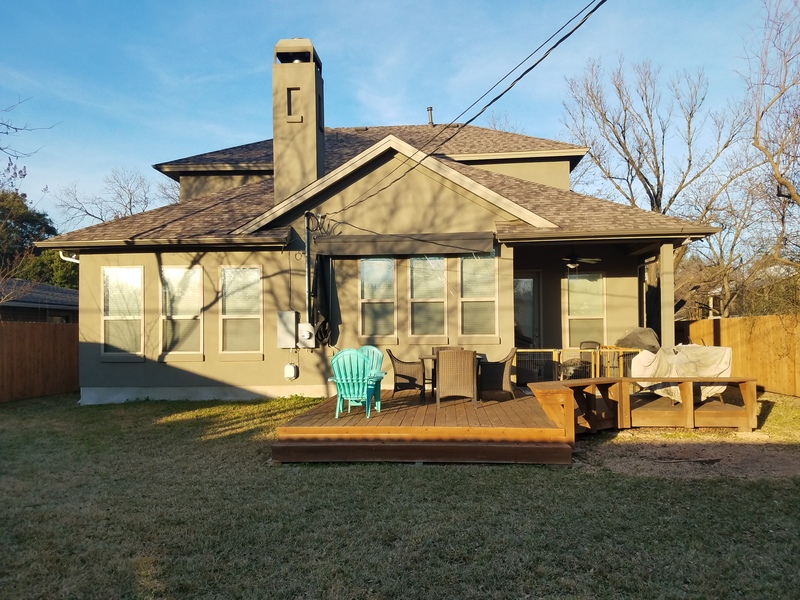 If you would like to challenge us to create the patio, porch and outdoor kitchen combination project of your dreams, contact Archadeck of Austin today at (512) 259-8282 or via email at jim.odom@archadeck.net to schedule a free design consultation. This entry was posted on June 10, 2017 by austinporchandpatio. It was filed under Archadeck of Austin, Austin outdoor kitchen, Custom Outdoro Fire Features, Multi-structure outdoor living areas, Natural stone outdoor structures, Outdoor Kitchens, Patios, Patios and Hardscapes, Permeable Patios, Porch Enclosures and was tagged with Archadeck of Austin, Custom Outdoor Living Space Builder Near Me, Luxurious Outdoor Living Spaces, Northwest Austin Custom Fire Wall, Northwest Austin Outdoor Fire Features, Northwest Austin Outdoor Kitchens, Northwest Austin Patio Builder, Northwest Austin Screened Porch Builder.